As I said in my recent post, I was previously lucky enough to win two amazing giveaways over on Twitter. 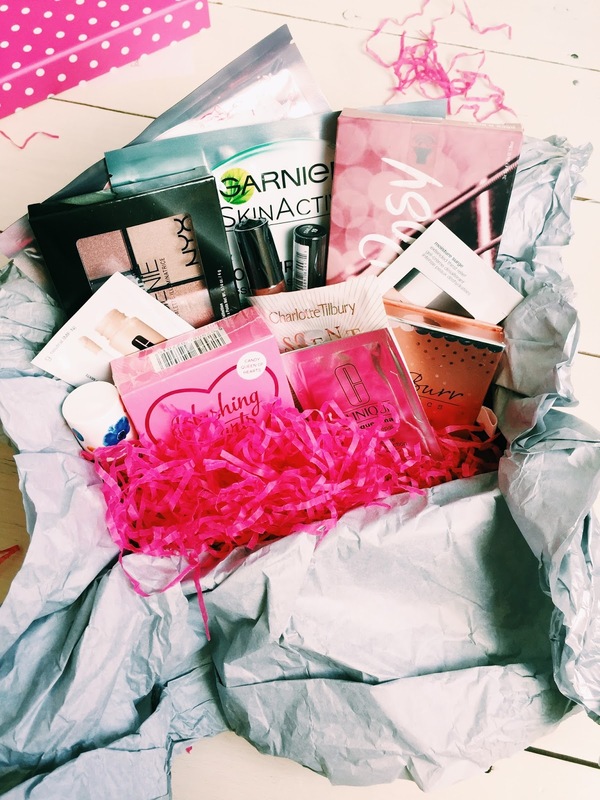 One of them was a box of Beauty goodies (worth over £60) from the lovely Hannah, then there was the To-Do List pad that I won in a giveaway from Mia Felce. I am usually the kind of person that never wins anything and I am so so grateful for these winnings. Here is a post reflecting on my first impressions of every item I gladly received. 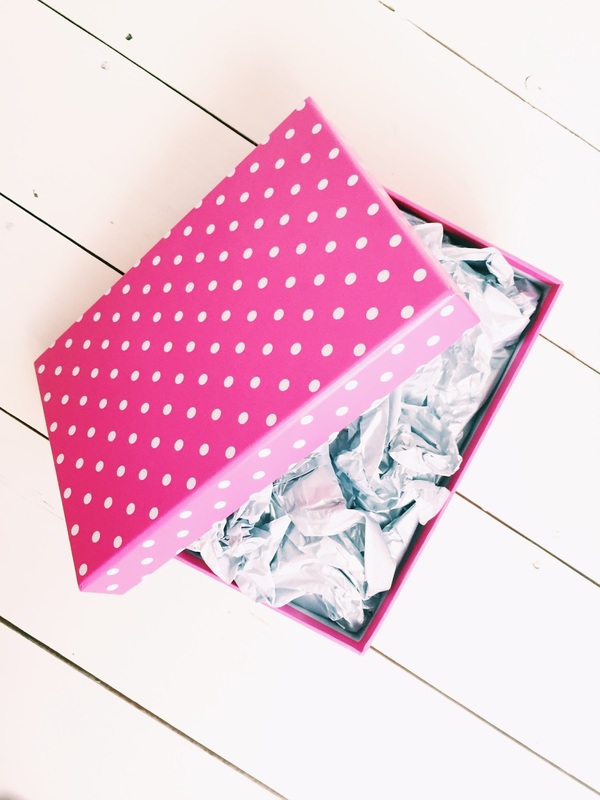 When this parcel arrived (or more so, got picked up from the Post Office because, as ever, I missed it) I opened the impeccably wrapped paper to a pink polka-dot box. Inside the box was a letter, kindly written by Hannah with some really heartwarming words. Honestly, she is so lovely - you should follow her Twitter here. Along with a hella lot of silver tissue paper and shredded pink tissue paper, there were a lot (a lot!) of amazing goodies inside. 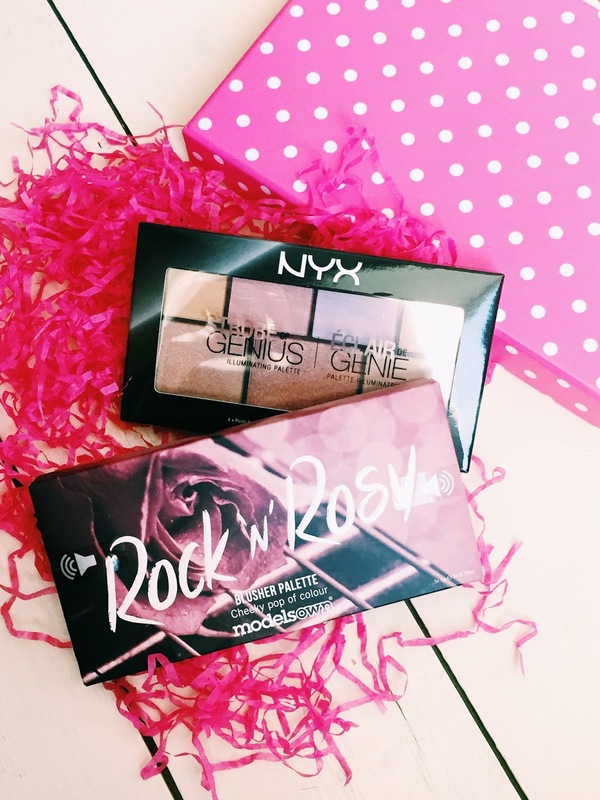 The first products are the Models Own Rock & Rosy Blush Palette in Pyxie Pink and the NYX Strobe of Genius Illuminating Palette. Firstly, the Illuminating Palette looked really intriguing to me. 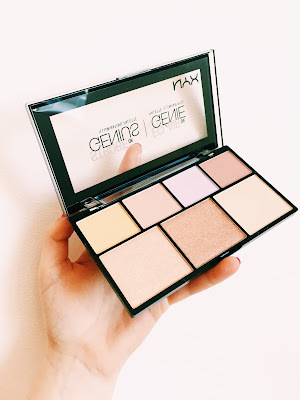 Initially I thought it was just a highlighter palette with lots of different colours but then, when looking a bit further into it, I've realised that this little palette of magic isn't just designed to get your cheek bones 'poppin'. With Bronze colours, rosy colours, and an array of highlighters, this set of pressed shimmer powders looks like the perfect way to glam myself up for a night out or whenever I feel like I want to shine. I am yet to try the Rock & Rosy palette on my face but I have swatched this trio. The lovely pearly packaging includes 2 pressed powder blushes - one is a very pale pink (Sugarspace) and the other is more of a rosy/coral pink (Sherbet) which I think looks perfect for adding that wintery-frost look across the face. At the far right of this one is a cream blush (Slipper). This one has more of a gold shimmer, making the shade a somewhat Rose Gold colour. I think the cream blush will probably be my favourite because I love the control and blendability of cream products. 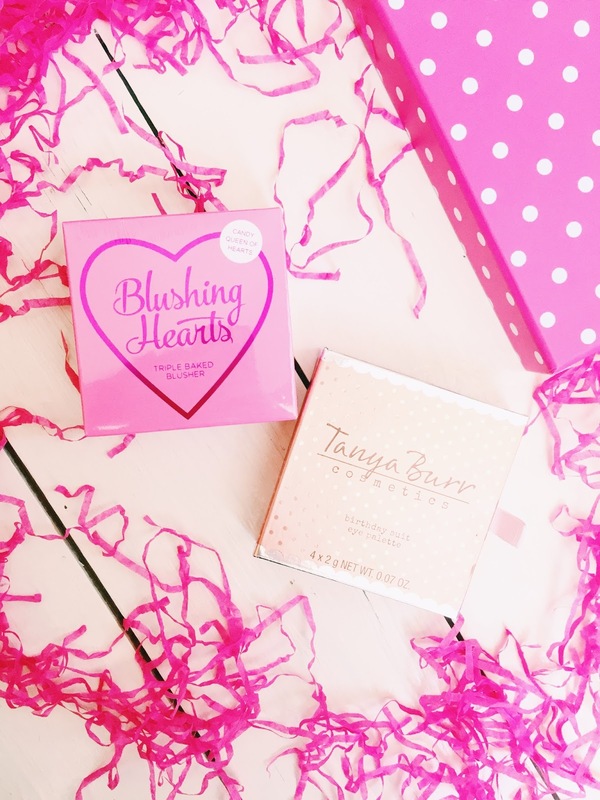 Next up is the I Heart Blushing Hearts Baked Blush in Candy Queen of Hearts along with the Tanya Burr Cosmetics Birthday Suit Eyeshadow Palette. Both of these products are somethings that I have always wanted and lusted over in Blogger's posts. Lucky enough for me, I have recently started finding a fondness for Blush after never wanting to wear it for a fear of looking like a porcelain doll, so getting the blush that I've always wanted to try is wonderful! 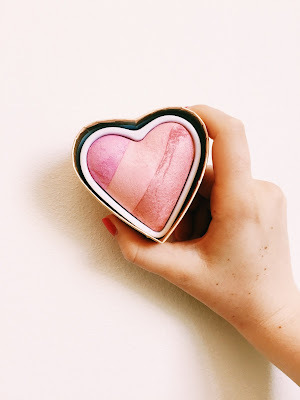 The Blushing Hearts baked blush is a huge size and consists of 3 very complimentary colours. When brushed over together they produce this glamorous true rose shade with a lot of shimmer. On the skin, the blush isn't too striking or crazy and I really praise it for that. I can't wait to get using it some more. While my prejudgment on YouTuber merchandise and cosmetics is always a little more on the negative side, I've always had the desire (and not the pocket) to try one. 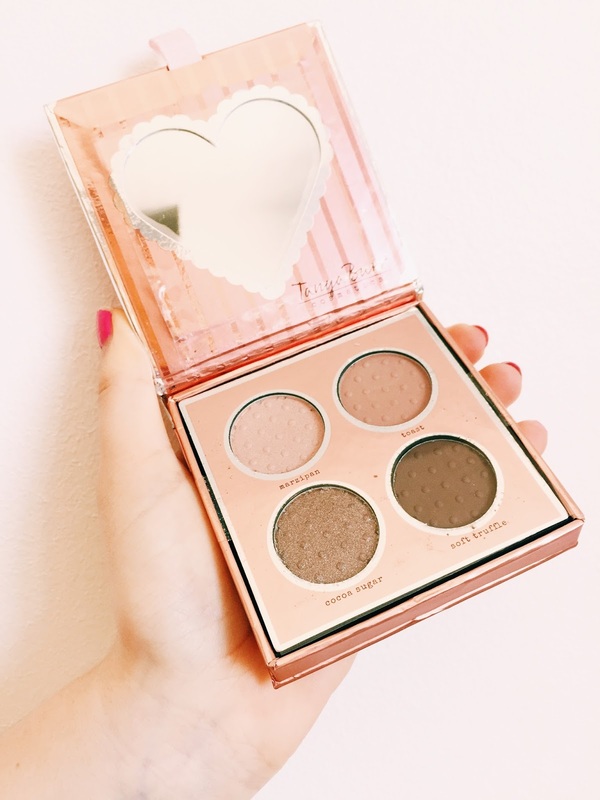 Out of every Tanya Burr eyeshadow palette, Birthday Suit is most definitely the one that I would've picked up myself so I was delighted to get this in the box. On first glance, the colours are so soft and are the kind of colours that are fitting for either day or night. I honestly couldn't pick one favourite but Toast really does stand out for me. This light, peachy brown is exactly what I want for the kind of days where I'm just popping to the shops and want to add a bit of definition. As well as that, I love the chunky glitter in Coco Sugar and I think it's name suits it so well. There was then the Limited Edition KIKO Nail Lacquer in Tropic Heat Strawberry and two NYX Lip products: The Liquid Suede Cream Lipstick in Soft-Spoken and the Soft Matte Lip Cream in Cannes. Firstly, the Lipsticks are just to die for. I've tried the Matte Lip Cream before in Stockholm and, when buying my first one, it was always between Stockholm and Cannes. I can't describe how perfect this dark, dusty pink colour is for me. 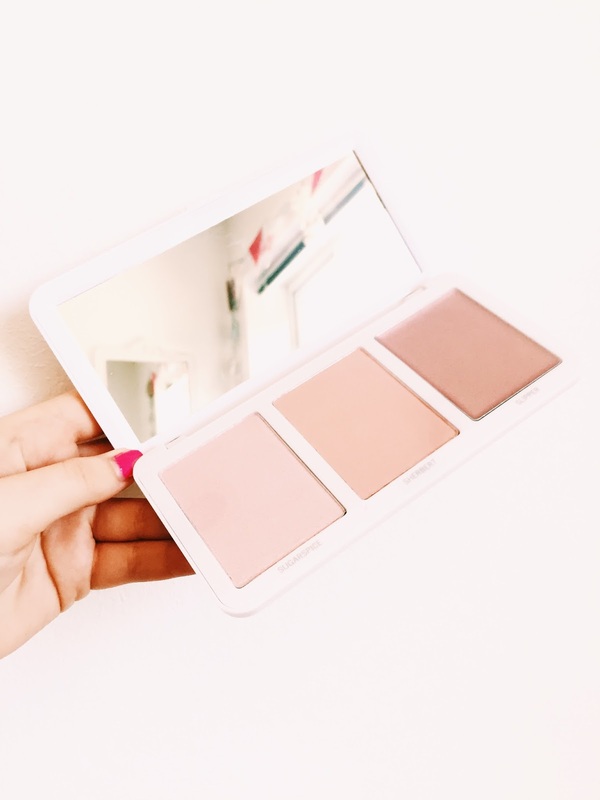 It flatters my skin tone, the formula is so soft, not drying, only requires a thin coat, and is exactly the kind of colour that I enjoy wearing. Contrastingly, the Suede Lipstick is more of a brown with a very slightly purple tone (in comparison to the more red Cannes) with more gloss. This isn't typically the kind of shade that I would wear on my lips but, with it's irresistible formula, and with Autumn coming up, I reckon this will be with me at all times. The Limited Edition KIKO polish is a very sweet, traditional pink however slightly more dusty - a colour that I think is missing from my collection. It does claim to smell like strawberries but I really just can't pick that up. Lastly, in the giveaway from Hannah, I got a handful of samples. I have only yet had chance to use the Scent Of A Dream perfume sample by Charlotte Tilbury which, I must say, smelt exactly how I imagine Tilbury to smell: rich, floral and sensual. As well as that sample, I got a bunch of Clinque samples. So far I've only tried one of the samples which is the Moisture Surge and I have fell head over heels in love with it. Right now, there isn't a product that I want more than that but it comes with such a hefty price tag. The huge looking samples are actually the Garnier Moisture Bomb Tissue Masks in Green Tea and Chamomile. 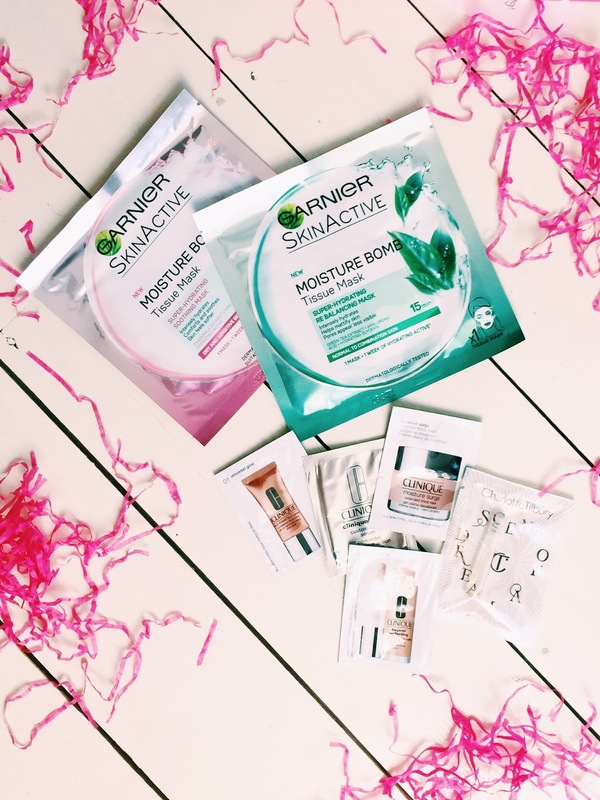 I am so excited to try these because I adore face masks, having fun with them, and indulging in a pamper session. I'm so pleased that these were included; I always suffer with dry skin so the hydrating qualities should hopefully be my saviours this winter. Since finding Mia's brand a few months ago, I have always been in awe at her work and recently fell in love with the tropical and brush stroke prints that she has designed. 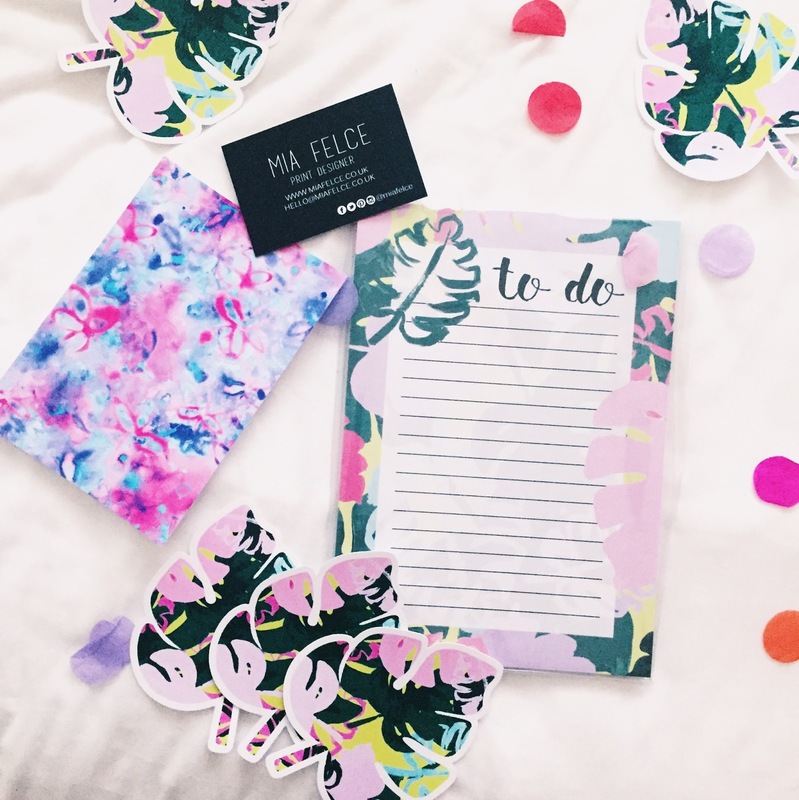 You have to check her out if you're looking for stationery, ways to keep yourself organised, or just quirky designs to add to your collections. The prize that I won was the Monstera Leaf To Do List Pad which is a tear-off paper pad of 50 sheets, each consisting of a quirky multicoloured Monstera Leaf pattern. The quality of the pad is incredible; the pages feel super soft and well printed. They are easy to tear off without ripping the page and the whole pad is card backed which also makes it useful for when it needs to travel with me. One of the most brilliant things about this was also how beautifully packed the gift was. Held safe in a Mia Felce card-backed enveloped and including a burst of colourful confetti, this giveaway prize definitely put a smile on my face. I feel so lucky to have won such amazing items from such amazing people. 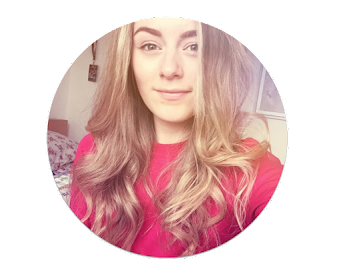 Don't forget to check out their blogs and social media as another little thank you from me. Also, make sure you keep an eye on my social media because I have more giveaways coming your way soon!